The UNSW Library exhibition, curated by Dr Erin Brannigan with the participating artists Martin Del Amo, Branch Nebula and Vicki Van Hout, features installations by each of the artists and live presentations. The latter have been video recorded and will become publicly available. As well, Erin Brannigan has recorded interviews with the artists, writers reading their RealTime reviews and other archival material. 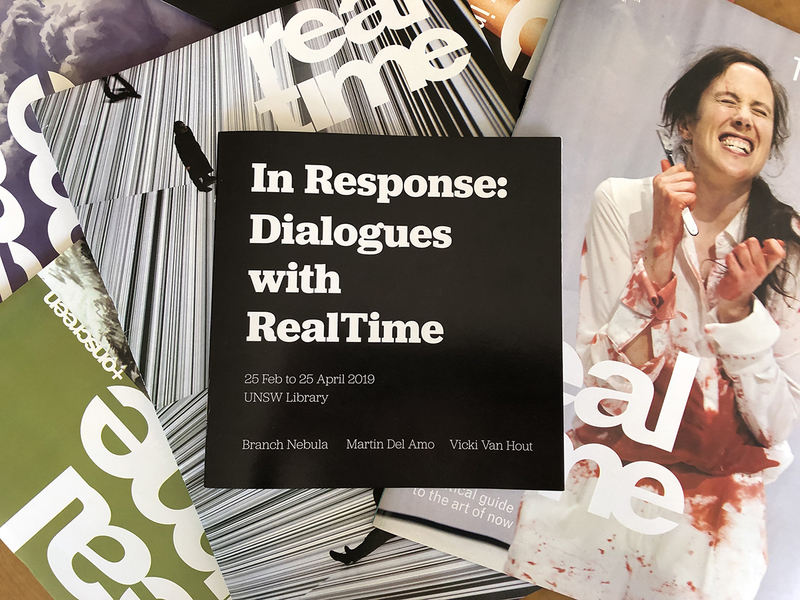 Edited by Erin, a writer on dance for RealTime since 1997 and a Senior Lecturer in Theatre and Performance Studies at UNSW, the catalogue features essays on the relationship between the exhibited artists and reviews that appeared in the magazine. Dramaturg John Baylis writes about Branch Nebula, dancer Lizzie Thompson on Vicki Van Hout and dance scholar Amanda Card on Martin Del Amo. Keith Gallasch and Virginia Baxter delineate their vision of the art of reviewing. The exhibition, the performative presentations and the associated online material helps sustain the RealTime archive while simultaneously furthering its reach and cultural value.